The process of obtaining an HSMBC designation is long and arduous. 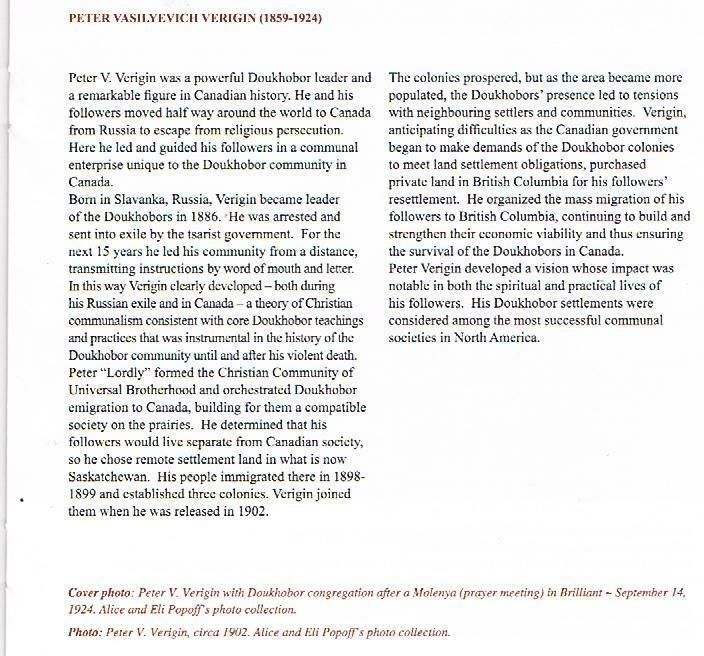 My attempts at obtaining the designation for Peter V. Verigin as a Person of National Historic Importance and the Migration of the Doukhobors to British Columbia from Saskatchewan as an event of National Historic Significance began about 2005. After a year or so of lobbying the case at various levels, it was finally deemed worthy of consideration. Continuing dialogue and consultation then took place for two more years before both were granted in 2008. This included the seeking of sponsoring letters from those also anxious for the designations to succeed to countering opposing arguments from those who were in opposition. 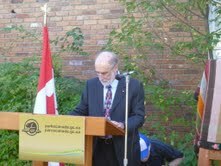 All of this was done through the intermediary of the officials and historians of the HSMBC of Canada, and while I was active in seeking letters of approval, I was not informed of the identity of various naysayers, although I had to satisfy the intermediaries of my case in face of certain opposition. 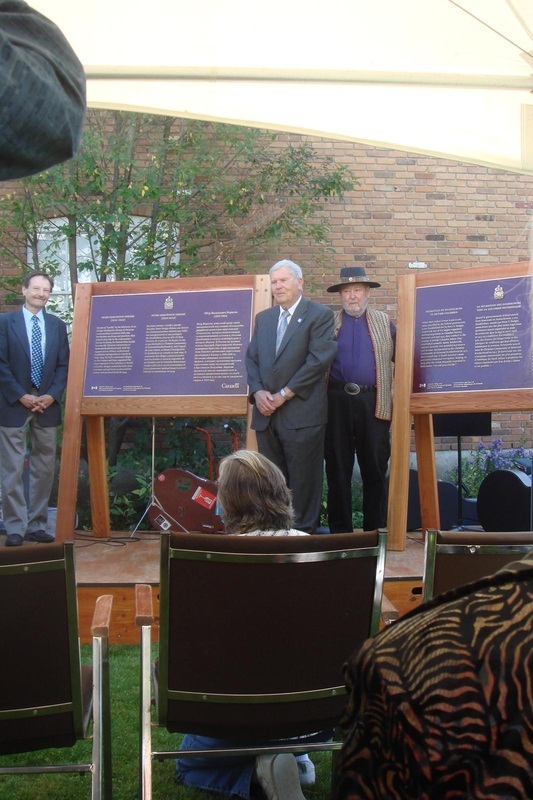 Although the designations were granted in 2008, it then took a further three years before the plaque wording could be finalized. The rules were strict in the amount of characters that could appear in the script, certain translation styles had to be followed, our desire for Russian inclusion had to have official sanction, and then the actual wording had to satisfy various parties. Certain well intentioned suggestions had to be countered because they created an incorrect impression or even an inaccuracy. Compromises also had to be made to satisfy the historians and guidelines of the HSMBC, who, while not thoroughly knowledgeable of the subjects, had their own predilections. Once this was agreed upon, the plaques had to be cast in bronze, a lengthy process, and then put into storage for a year until all interested parties, particularly government officials, were available at a prearranged time in order for the plaques to be officially unveiled. While the actual event appeared to be relatively straight forward, this too, required a year of planning and several proposed dates had to be postponed for political considerations because of coming elections and the availability of attendees. Needless to say, it was with a great feeling of relief and accomplishment on my part that this final ceremony took place in September of 2012. The goal, in sight for six years or more, had finally been achieved. Once the original petition is approved for consideration, then the formal application can begin. * Peter V. Verigin, Peter Lordly Verigin, Petushka [Russian diminutive]. Russia until his death in 1924 in Canada. 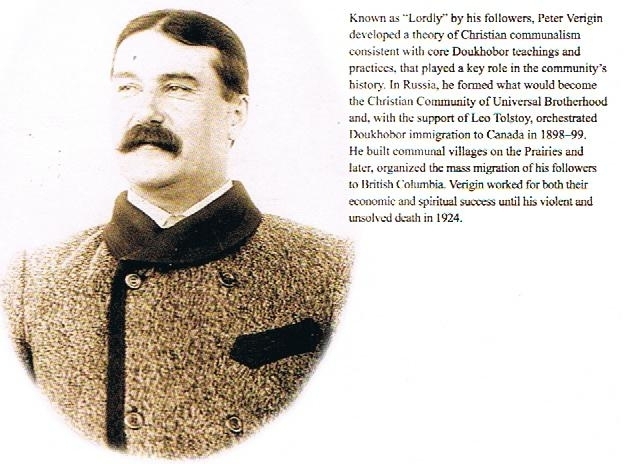 Charismatic and brilliant, as well as shrewd and pragmatic, his greatest contribution to Canadian history was his leadership of the Doukhobors in Canada where he arrived in 1902 after 16 years in Siberian exile, responsible for the greatest single mass immigration to Canada in 1899, 7,500 Doukhobors from Russia, later, in 1908, responsible for the largest internal migration of a group within Canada, 5,000 Doukhobors move from Saskatchewan to British Columbia in 1908 under his leadership. The most direct, tangible monument at the present is the Brilliant Suspension Bridge [a national historic site of Canada] at Castlegar BC, which was designated an Historic site by the Historic Sites and Monuments Board in 1995, and was built under his supervision in 1913. A further important designation is the village of Verigin, Saskatchewan, a railway station and past headquarters of the Christian Community of Universal Brotherhood. This village was formed by Peter V. Verigin after his arrival in 1902, adopted by the railway line [though misspelled as Veregin] and exists to this day. The above mentioned bibliography  can be provided. This application is being made by Larry A. Ewashen, Curator of the Doukhobor Village Museum, which is sponsored by the Kootenay Doukhobor Historical Society. Mr. Ewashen is also a Director of the Council of Doukhobors in Canada, an amalgam group of representative Doukhobor societies across Canada, who all subscribe to Peter Verigin’s suitability for recognition. The City Council and Mayor Michael O'Connor of Castlegar are also in favour of this submission. 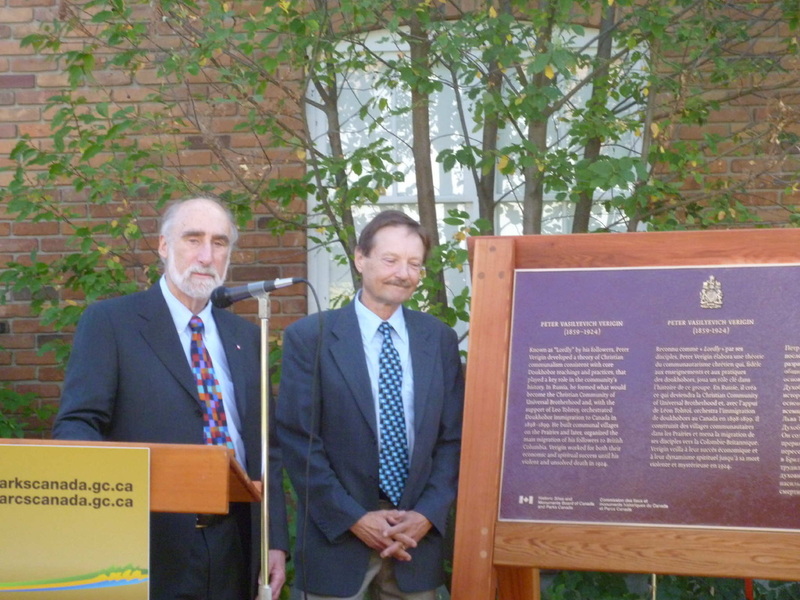 The logical plaque location for Peter V. Verigin is the Doukhobor Village Museum. 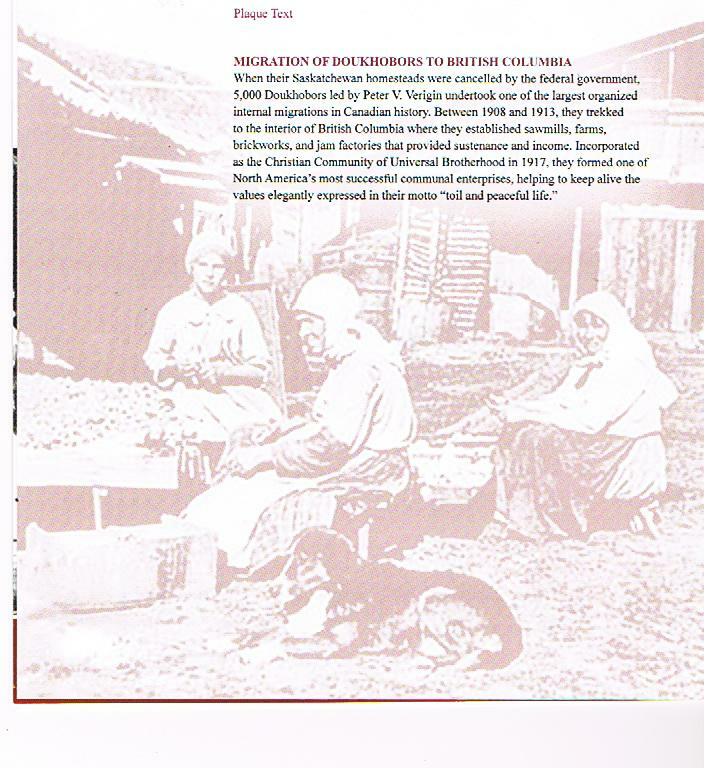 The museum documents the contribution of the Doukhobors in British Columbia and Canada in which he played a primary role. Moreover, the museum is located on property which Verigin originally bought in 1908 to begin the BC settlement. There is a sign at the entrance which notes this, and it is here that such a plaque should be located. 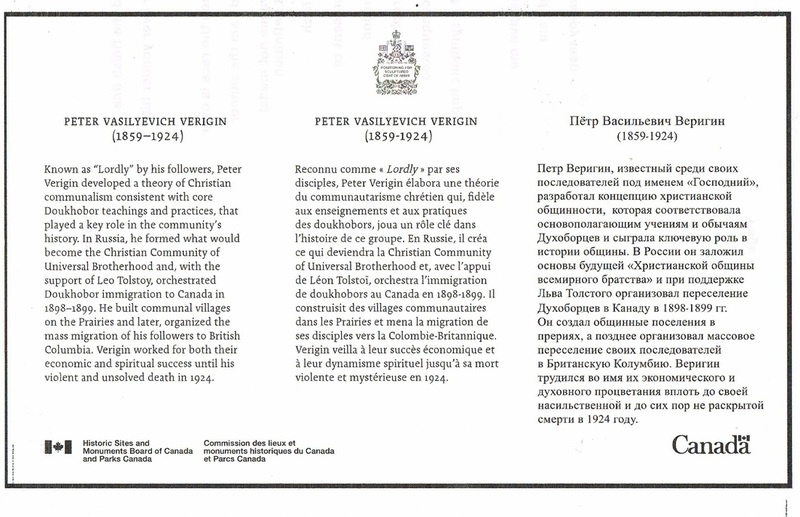 Since Peter Verigin is responsible for the single biggest immigrant group coming to Canada [7,500 in 1899], and further, since he is responsible for the largest immigration group between the provinces [5,000 from Saskatchewan to BC [1908-13], he is a person of national historic importance. Peter Verigin was the leader of the Doukhobors from 1886 to 1924. This leadership began in Russia and continued when the Doukhobors immigrated to Canada in 1899. Part of this leadership was conducted from 16 years of Siberian exile. In 1902, he was permitted to come to Canada. Between 1908 and 1913 he led the Doukhobors from Saskatchewan where their land was forfeited, to British Columbia, where, under private ownership, the communal system of the Doukhobors could be maintained. In 1917, he formally incorporated the Christian Community of Universal Brotherhood with $1,000,000. capital, an astonishing achievement for the time. The commune continued to flourish until 1938, when it was forced into bankruptcy at the height of the depression - at that time valued at @ $10,000,000. He did not live to see this demise, as he was killed in a mysterious, still unsolved train explosion between Castlegar and Grand Forks in 1924. In addition to being a dynamic leader, he was a supreme agriculturalist pioneering strip farming in Saskatchewan, organizing the agrarian empire in British Columbia and developing two strains of apples suitable for the Kootenay area. In the 20s he was nominated as Master Farmer of the Kootenay area. The criterion for the nomination of Peter Verigin as a person of vital historical importance is fulfilled. 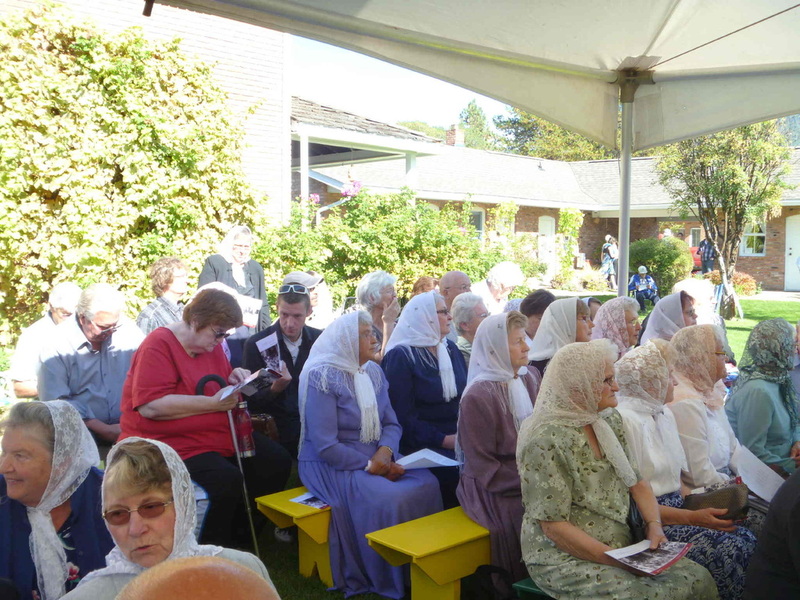 As leader of the Doukhobor community and its entire body of members which have contributed so much to our Canadian mosaic his importance is undeniable. 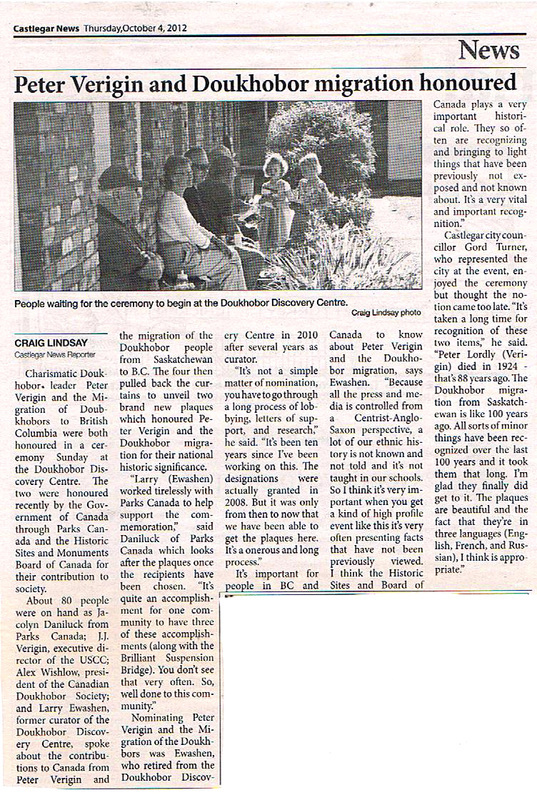 40% of Castlegar and Grand Forks are still of Doukhobor descent, the legacy of the Doukhobors to the cultural and ethnic life of BC cannot be questioned. The Doukhobor Village Museum is on the site of the original purchase made by Peter Verigin, and this is duly noted at the entrance. The recognition plaque with a brief description would also go in this area. 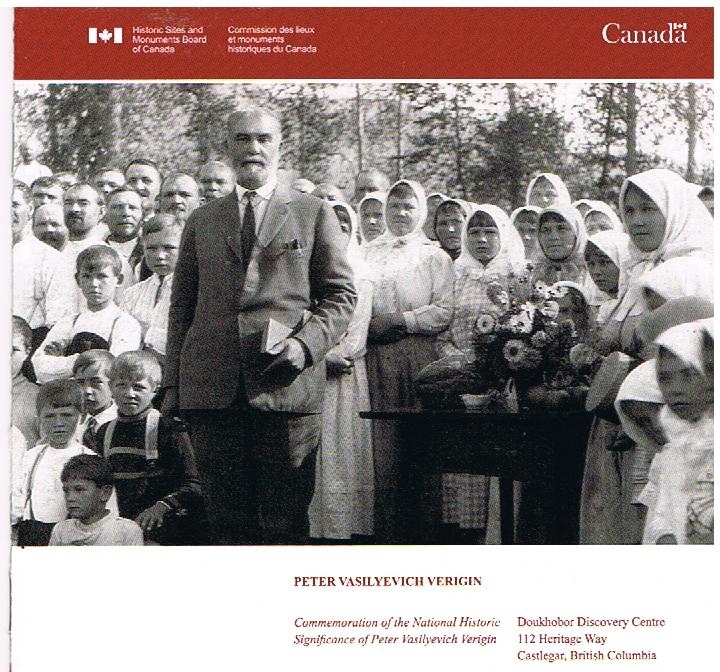 An exhibit devoted to Peter Verigin is planned for the future and the major exhibit for 2006 is concentrated on the Doukhobor commune, The Christian Community of Universal Brotherhood of which he was the spiritual mentor and Chairman. This area in general and this museum in particular is the logical place to recognize this outstanding leader and pioneer. When he brought the Doukhobors to this area in 1908, they became the primary agriculturalists and industrialists of the area, pioneering large scale fruit farming, saw mills, brick factories and other achievements such as the building of the Doukhobor Suspension Bridge, the first of its type in the area and now a National Historic Site. It is near the location of the Doukhobor Village Museum and its heritage orchard. At this time, the town and area has no monuments to its pioneers and such recognition would stimulate an interest in the community in its history and origins, and hopefully lead to a greater search for knowledge of the heritage of the area. At the present time, many children come to the museum with little background of their own ancestry, national recognition of the local pioneer would stimulate an interest in local and provincial and Canadian history. - formed the Christian Community of Universal Brotherhood, at the time of its demise in the depression in 1938, the largest commune in North America. 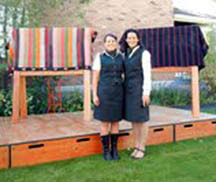 - The Doukhobors of Canada, a strong component of early heritage history, continue to make a profound contribution to Canadian culture, ranging from Lois Hole, Lieutenant Governor of Alberta to Debbie Brill, Olympic athlete, both relatives of Peter V. Verigin, but only two of a myriad of Doukhobor contributors to Canadian life ranging over all professions and works. - was tragically assassinated in 1924 in a yet unsolved train explosion on his way to a business meeting from Castlegar to Grand Forks, this is an enduring Canadian criminal mystery that has not been solved to date. 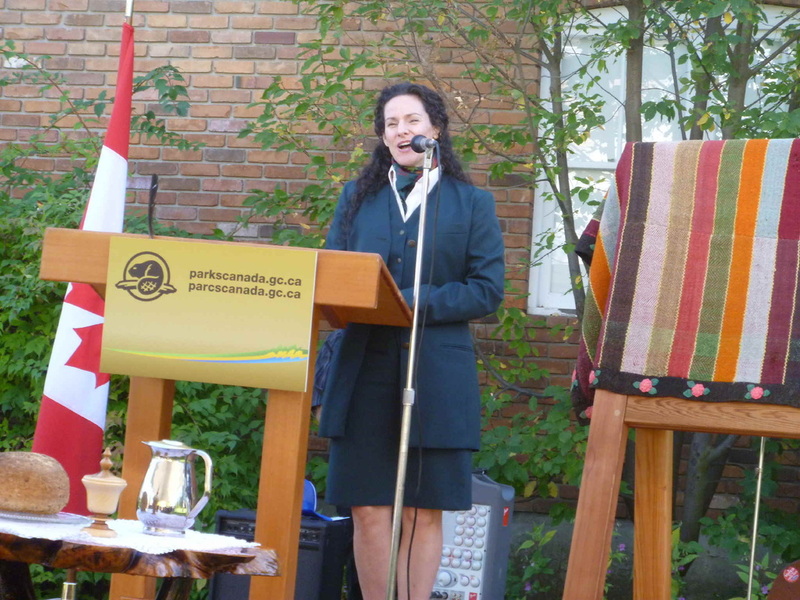 Charismatic Doukhobor leader Peter Verigin and the Migration of Doukhobors to British Columbia were both honoured in a ceremony today by the Government of Canada through Parks Canada and the Historic Sites and Monuments Board of Canada at the Doukhobor Discovery Centre. 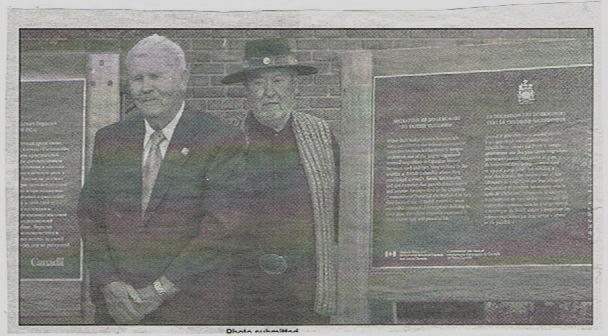 About 80 people were on hand as Jacolyn Daniluck from Parks Canada; J.J. Verigin, executive director of the USCC; Alex Wishlow, president of the Canadian Doukhobor Society; and Larry Ewashen, former curator of the Doukhobor Discovery Centre, spoke about the contributions to Canada from Peter Verigin and the migration of the Doukhobor people from Saskatchewan to B.C. 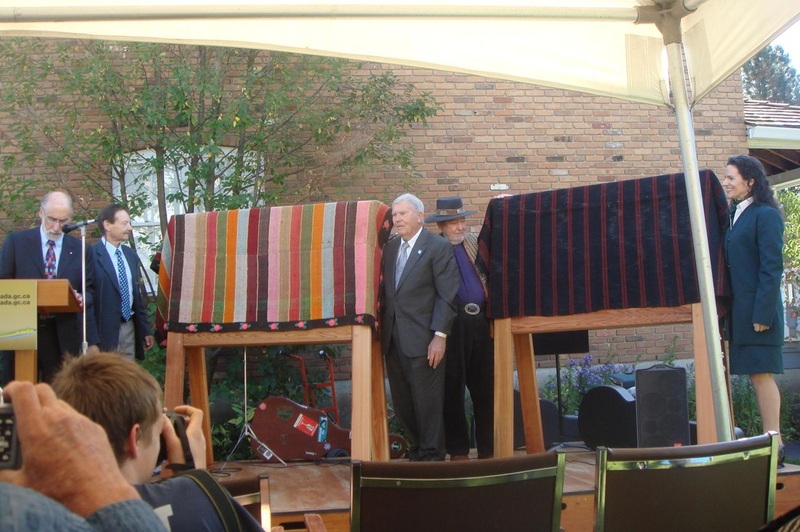 The four then pulled back the curtains to unveil two brand new plaques which honoured Peter Verigin and the Doukhobor migration for their national historic significance. 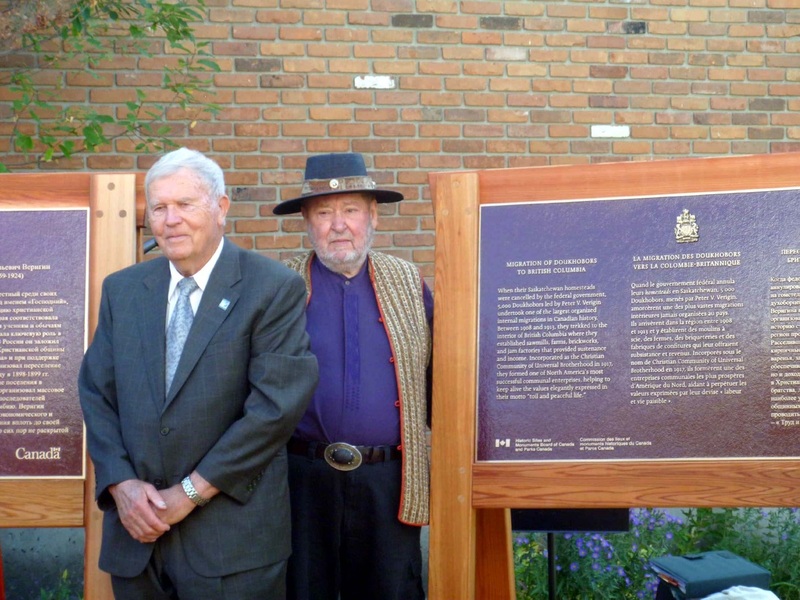 "Larry (Ewashen) worked tirelessly with Parks Canada to help support the commemoration," said Daniluck of Parks Canada which looks after the plaques once the recipients have been chosen. "It's quite an accomplishment for one community to have three of these accomplishments (along with the Brilliant Suspension Bridge). You don't see that very often. So, well done to this community." 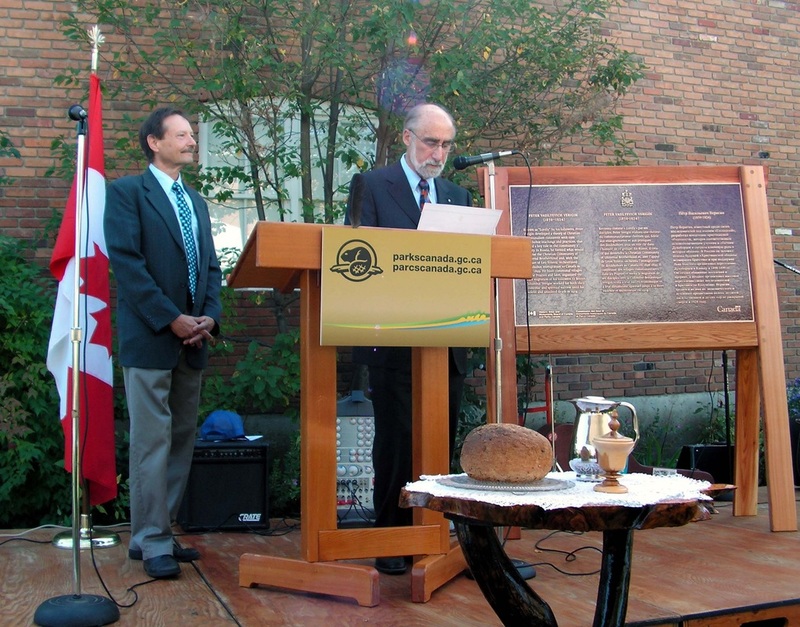 Nominating Peter Verigin and the Migration of the Doukhbors was Ewashen, who retired from the Doukhobor Discovery Centre in 2010 after several years as curator. "It's not a simple matter of nomination, you have to go through a long process of lobbying, letters of support, and research," he said. "It's been ten years since I've been working on this. The designations were actually granted in 2008. But it was only from then to now that we have been able to get the plaques here. It's a onerous and long process." 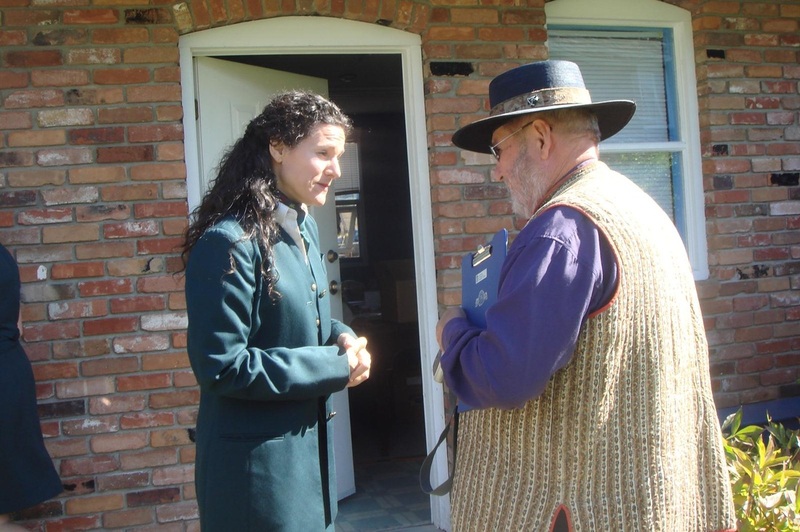 It's important for people in BC and Canada to know about Peter Verigin and the Doukhobor migration, says Ewashen. "Because all the press and media is controlled from a Centrist-Anglo-Saxon perspective, a lot of our ethnic history is not known and not told and it's not taught in our schools. So I think it's very important when you get a kind of high profile event like this it's very often presenting facts that have not been previously viewed. I think the Historic Sites and Board of Canada plays a very important historical role. They so often are recognizing and bringing to light things that have been previously not exposed and not known about. It's a very vital and important recognition." 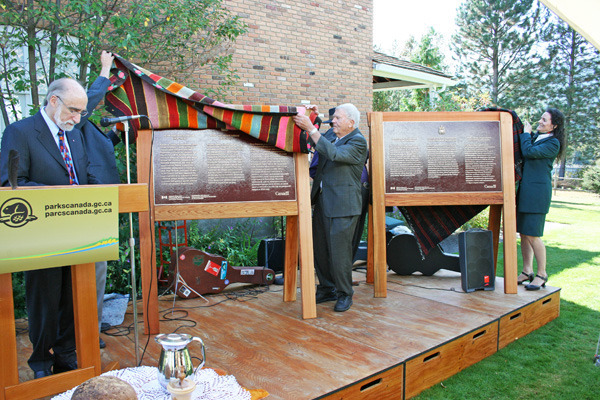 Sunday, Sept. 30, was a long awaited day for ethnic and history buffs across Canada, as the Historic Sites and Monuments Board of Canada officiated a special unveiling at the Doukhobor Discovery Centre in Castlegar. 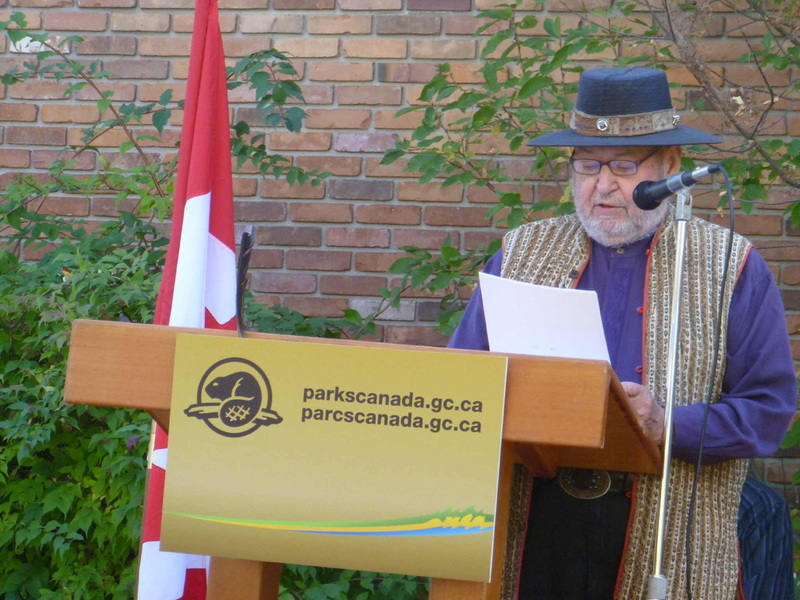 Peter V. Verigin was declared a Person of National Historic Significance, and the migration of the Doukhobors from Saskatchewan to British Columbia, an event of National Historic Significance. The day marked the culmination of ten years work for Mr. Ewashen who began the nomination and declaration process when he was the Curator of the museum. 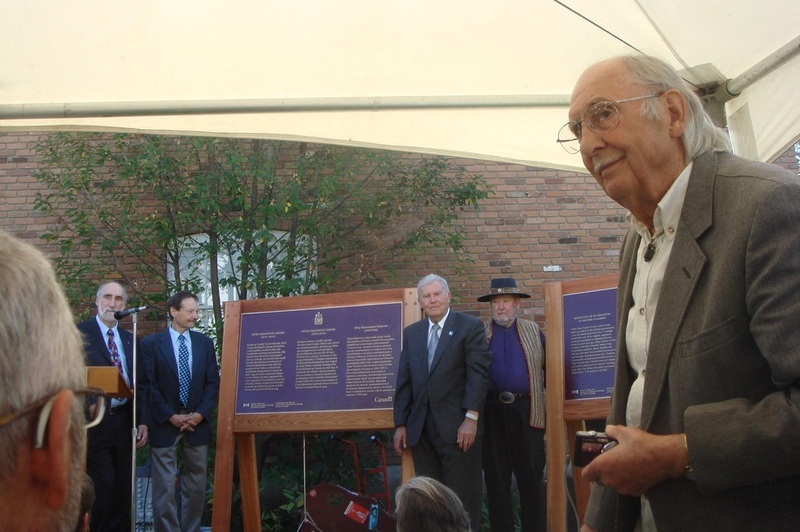 Throughout this time, he enlisted the aid of many prominent Canadians such as J. J. Verigin Sr. Order of Canada, Alex Atamanenko, Member of Parliament and Senator Pat Carney to add their recommendations to this cause. 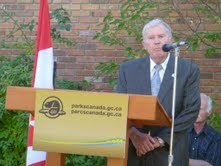 The platform party also included local resident Alex Wishlow, President of the Canadian Doukhobor Society, who spoke about Peter Verigin. It is a special privilege for me to speak about Peter Vasilievich Verigin. Petushka, as I refer to him is my hero, Let me tell you about Peter Lordly Verigin -- Petushka Gospodnii. At the age of 24, Petushka began religious and temporal teachings under the direction of LUSHACHKA,the Doukhobor leader in Russia. He became the leader of the Large Party of Doukhobors in 1886. He was a giant, both physically and intellectually. He stood above the crowd, a six-foot man, broad shoulders, keen gentle eyes. He was exiled from his people for sixteen years because of the reaction to his leadership by the Government and the state church. During his exile, he corresponded with Lev Tolstoy; he read the Bible and New Testament; he studied philosophical writers. Under his watch, the Doukhobors burned their weapons, 7,400 moved to Canada, and Created a community which was the marvel of the world. In 1917 the Christian Community of Universal Brotherhood was assessed at $20,000,000 in today’s dollars. Just 18 years after they arrived. He was killed on October 29, 1924: Canada and the world lost a great man. Doukhobors lost a community. Andrei Semenoff lost his best friend and man he truly loved. Andrei salvaged the clothing that Petushka was wearing when he died. He cleaned them and built a display cabinet for them. For a long time he kept them in his home. 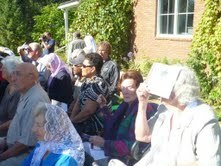 Today, the cabinet is in the Doukhobor Discovery Museum. To accomplish what he did, Petushka needed to be a Superior Doukhobor, charismatic and multi-talented, He was a Visionary. He was a great leader. He served Doukhobors for 38 years. He was a good teacher and a spiritual soul. He became a non-smoker, non-drinker and a strict vegetarian for the rest on his life. He was concerned about the health of his followers. He was a humble man. He held a firm belief in God. Lord, you are the light of my life. Why are we talking about him today? Because he was the spiritual and temporal leader of the Doukhobors – the CEO -- Chief Executive Officer. He guided his followers to accomplish much to benefit Doukhobors, Canadians, and the world. Because the 7,400 Doukhobors, on his watch, made an agreement with the Canadian government that they would come to Canada to settle the barren Northwest Territories and in return, the government would never force them to kill a human being. Because It is amazing what people can accomplish when they work together with a leader they trust and love. They cleared the forests, brought in water, built bridges and planted a virtual Garden of Eden right here in this Valley. 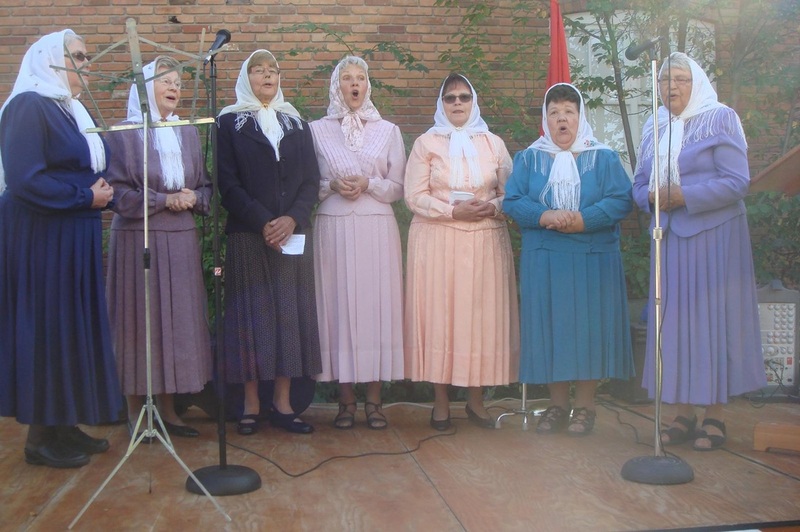 Because Doukhobor immigrants made significant contributions to the economic, cultural, and spiritual mosaic of Canada under their leader Peter (Lordly) Verigin. And their descendants still do. He truly deserves this recognition today. An important condition that the Doukhobors insisted on when immigration plans were negotiated was EXEMPTION FROM MILITARY SERVICE. 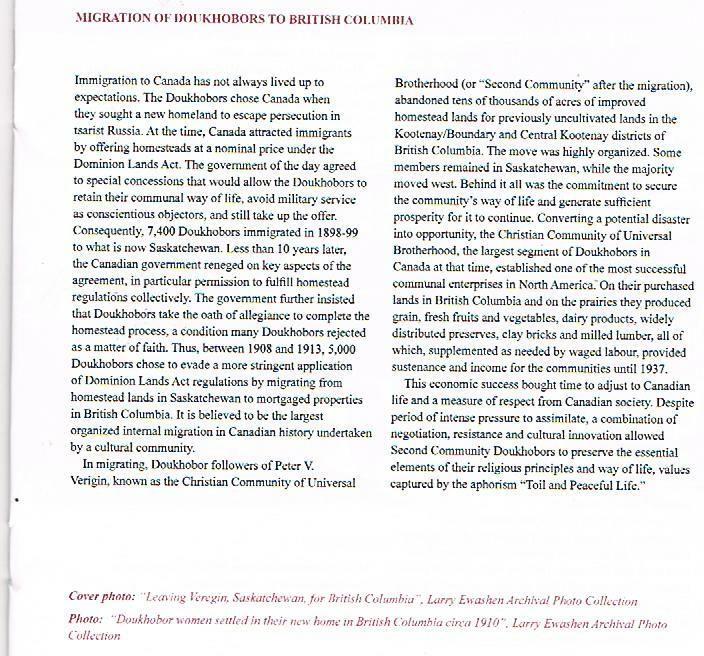 Canada had such a provision since 1868 and on December 6, 1898, an Order-in-Council specifically added the Doukhobors. A second condition was 'Land in a bloc’. The Russian mir system regarded land as a common resource to be used in a cooperative fashion, and this was the system they were adamant to maintain. This was the system granted. According to the Dominion Homestead Act each settler was allowed a quarter section homestead. In lieu of cash, the entrant had to register the homestead in his name and pay a fee of $10.00. Next the homesteader had to live on the homestead at least six months each year for three years, and cultivate and seed an acreage. Upon completion, the entrant could apply for title. The patent form required the oath of allegiance. To allow for the 'land in a block' provision, the previously approved Hamlet clause was used instead of the Homestead Act. For the 7,400 new settlers the government provided 770,000 acres on which the migrants built 63 villages. To accommodate village settlement rather than families on each quarter section, the Hamlet Clause allowed them to live in a village within three miles of the homestead quarter section. 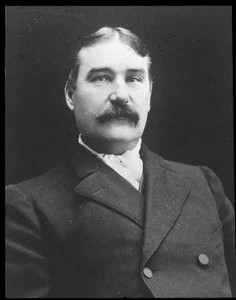 Clifford Sifton, Minister of the Interior, guaranteed this arrangement in February, 1903, and also allowed Peter V. Verigin and two elders to make entry on behalf of all of the settlers. This arrangement was cancelled in 1907 by the new Minister of the Interior, Frank Oliver, who enforced the Dominion Land Act overruling the cultivation and residence concession. 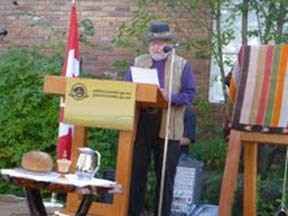 He accepted a recommendation by Reverend John McDougall to cancel the reserves, and indicated eviction if individual entries were not made. The oath of allegiance was required. The oath states in part: I do sincerely promise and swear that I will be faithful and bear true allegiance to His Majesty King Edward VII and will defend Him to the utmost of my power against all traitorous conspiracies - all this I do swear. So help me God. Most thought that such an oath would lead to a negation of conscientious objector status, and more over, individual dwelling on each quarter section would put an end to their communal life style. Despite objections both within and without the community the new regulations were enforced on June 1, 1907 and 2500 homesteads were cancelled representing approximately 300,000 acres of land. 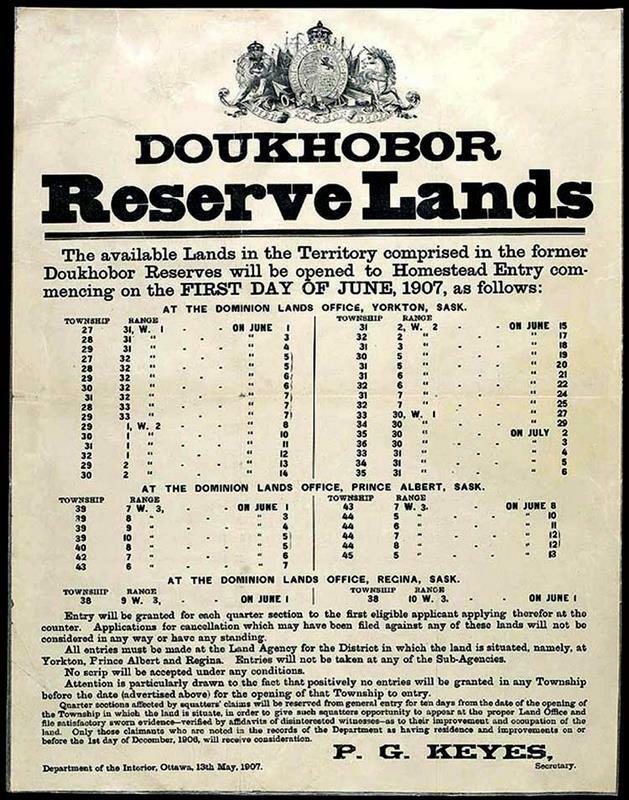 With the improved land now available to ‘more desirable settlers’ the outcome was an unprecedented land rush, and a devastating loss to the Doukhobor community of over $11,000,000. 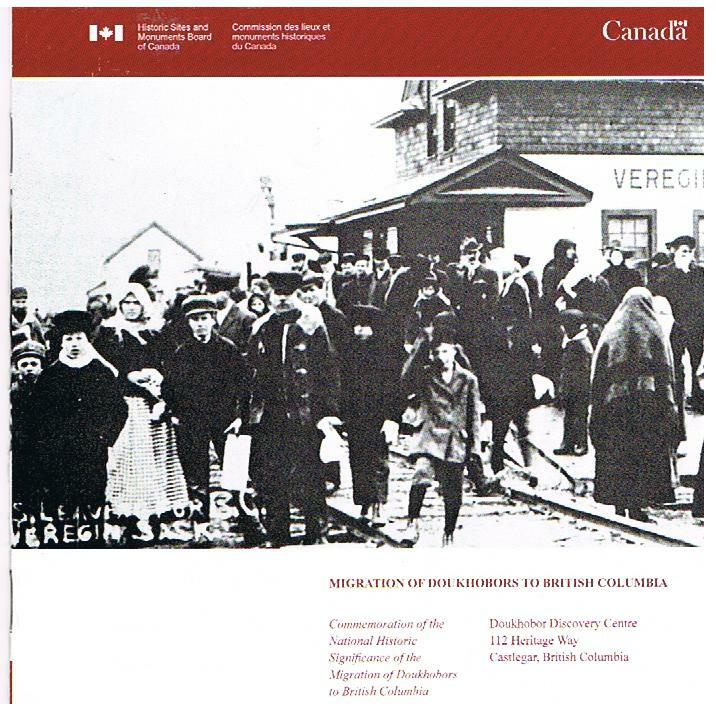 About two thirds sought refuge in British Columbia under the leadership of Peter V. Verigin between 1908 and 1913 in an effort to preserve their community. An oath was not required for purchase of land, and they purchased 21,600 acres including this property we are now standing on, to begin their new settlement. 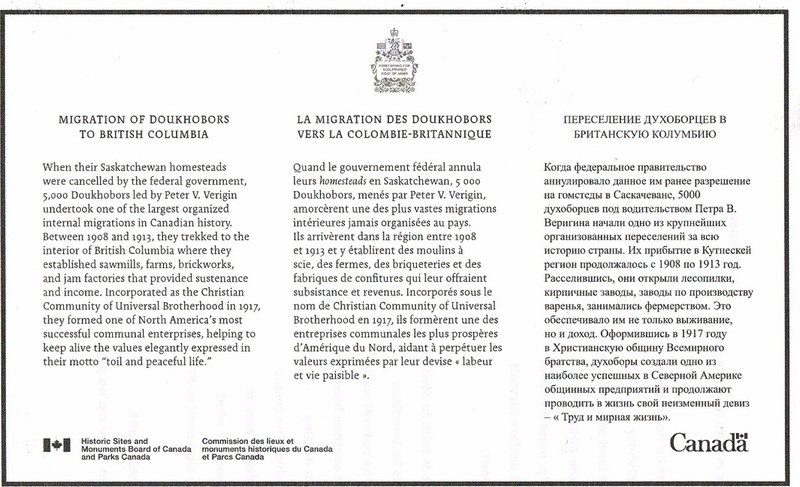 The Doukhobors had come to Canada to what they believed was a haven, escaping the tyranny of unjust monarchies. Is it any wonder that they chose to give up their hard won land when they were confronted with the prospect of defending royalty once more? And then attempted to retain their traditional life style? I would like to thank everyone who made this designation possible, not the least of which are our noble ancestors. The recognition of this trek is a timely and gracious act. In particular I thank the board of the Doukhobor Discovery Centre for helping me and bearing with me while I pursued these designations over the last ten years, and among many others, John J. Verigin Sr. O C, Alex Atamenenko MP, and Senator Pat Carney for their letters of support.